During a periodic review of Libya before the United Nations Security Council the International Criminal Court (ICC) denied a petition from Saif al-Islam Gadhafi, son of late Libyan leader Muammar Gadhafi, to drop an outstanding arrest warrant issued against him. The review took place Nov. 2. The warrant stems from “crimes against humanity” charges during civil strife and the subsequent foreign intervention resulting in the overthrow, torture and assassination of the elder Gadhafi in October 2011. The arrest warrant against the son was issued June of the same year. “As a fugitive from justice both in Libya and before the ICC, Mr. Gadhafi does not have procedural standing to challenge admissibility,” said ICC Prosecutor Fatou Bensouda, announcing the rejection of the request. Mr. Gadhafi, 47, filed an admissibility challenge in early June saying his case is inadmissible before the ICC because of double jeopardy after being tried and convicted in a Tripoli, Libya, court in July 2015 for the same charges. Mr. Gadhafi and eight others were sentenced to death in the proceeding widely criticized as flawed. Former Libyan intelligence chief, Abdullah al-Senussi and ex-Prime Minister Al-Baghdadi al-Mahmoudi, were also given death sentences. The case has been locked in a tug-of-war between the ICC and Libyan officials over jurisdiction, said analysts. Ms. Bensouda argued the ICC doesn’t recognize Mr. Gadhafi’s Libyan trial and conviction that was conducted via video conference in absentia which is illegal in Libyan law, the prosecutor contended. Mr. Gadhafi was imprisoned in 2012 in Libya’s western city of Zintan by local militia who refused to hand him over to Tripoli officials. According to the ICC report he was reportedly released on amnesty in April 2016 and is believed to still be in Libya. Under amnesty regulations the conviction was overturned. “My office maintains that Mr. Gadhafi must be arrested and surrendered to the court,” declared Ms. Bensouda. But critics say the ICC lacks credibility and dismisses the whole saga as faulty because the 2011 U.S.-NATO intervention was done on the basis of a lie that Muammar Gadhafi was murdering and persecuting Libyans to quell uprisings. 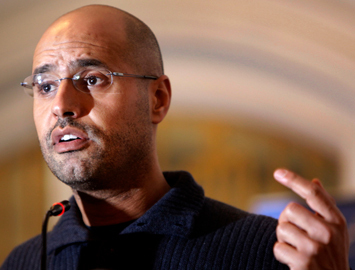 “The ICC case against Saif al-Islam Gadhafi must be seen in context of the illegal NATO assault on Libya, including the public murder of his father and the destruction of the Libyan state,” Australia-based political economist and activist Tim Anderson, told The Final Call via email. “That is a great crime that cannot be forgotten,” he added. The ICC charges against the Gadhafis were “pretexts for the aggression against Libya, and for the U.S. and NATO backed Salafist crimes against the Libyan people,” said Mr. Anderson. Warrants were also issued for Muammar Gadhafi and Mr. Sanusi. The warrant against Muammar Gadhafi was withdrawn, in November 2011, weeks after his assassination. Later in July 2014 the court’s Appeals Chamber ruled Mr. Senussi’s case was inadmissible before the ICC. The warrants were requested by the UN Security Council for events specifically in the first 10 days of uprisings that began mid-February 2011. A copy of the ICC warrant described Saif al-Islam Gadhafi as the “most influential person” in his father’s inner circle, who exercised control over crucial parts of the state apparatus, including finances and logistics and exercised powers of a de facto prime minister. Some ICC watchers noted that the Libyan case also points to a double standard where the ICC focuses on defendants predominately from Africa. “You have nations in Africa who have already begun to withdraw from the ICC,” said Don DeBar, anti-war activist and senior producer of Community Public Radio. The ICC mechanism has been hypocritical, Mr. Anderson points out. Ignoring western powers responsible for atrocities and killing worldwide in interventions and meddling. “Ignoring for example, the NATO powers aggression against at least eight middle eastern countries, in the past 20 years. Not one NATO leader has been prosecuted for the crimes against Afghanistan, Iraq, Palestine, Lebanon, Libya, Iran, Yemen or Syria,” said Mr. Anderson. Libya previously challenged the admissibility of the case being tried at the ICC in the Hague arguing that its national judicial system was actively investigating Mr. Gadhafi on the same accusations. Libya wanted to try the cases against Gadhafi era officials on Libyan soil.. Furthermore, according to the ICC, Libya is not a signatory to the Rome Statute that governs the court which poses a complication for an arrest. The ICC has no police force and relies on the signatories of the Rome Statute to enforce warrants of arrest in all cases. Before the Western intervention, Saif-Islam Gadhafi was widely touted as the successor of his father. Libyan insurgents backed by The U.S., France, Britain, Italy and NATO forces overthrew Muammar Gadhafi after he led for 42 years. 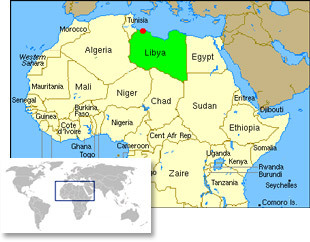 Since the intervention Libya has been in a state of instability and division and considered a failed state. Many of the Gadhafi era leaders were killed, exiled or incarcerated. In 2014, Libya split into rival factions with General Khalifa Haftar emerging as a dominant figure in the east, aligned with a regional parliament and government. It opposes the internationally accepted government based in Tripoli headed by Prime Minister Fayez Al-Sarraj. Although absent a stable government, it was announced earlier this year that Saif-Islam Gadhafi was planning to stand in presidential elections, slated for December 10 but postponed now until 2019. The post intervention collapse of Libya was widely predicted. In the aftermath the Honorable Minister Louis Farrakhan of the Nation of Islam said they have “let the dogs of destruction out,” predicting the years of chaos and mayhem that followed. Last year, the U.S. and other countries closed their embassies in Tripoli due to security concerns. Among the Libyans, the ICC is not a trusted entity on any side and is under a cloud of being part of the problem, not a broker for solution and justice. “The ICC was handed a fabricated brief to help cover up NATO's criminal destruction of a brave and progressive, small African nation. No one should lend them the slightest credibility in this endeavor,” advised Mr. Anderson.